Great news! Winter's over! Spring is here! Well, just in case you felt like living in the world of cold, cozy, comfort food weather a little longer (or unless you live in the Southern hemisphere), here's a little weekend project for you as the very last of the winter vegetables make their appearances at the market. 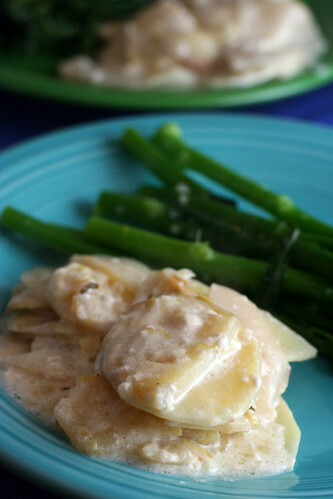 This Winter Root Vegetable Gratin introduced me to a few vegetables I had neither cooked with nor tasted before. Rutabaga? Celery root? Fun new things to play with! 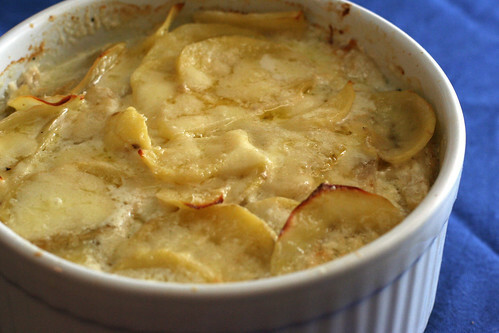 The best thing about this gratin is the herbaceous cream. That's right, I said herbaceous cream. I'm not messing around here. The aroma is intoxicating; make sure you have a place to sit down after you take a whiff of the simmering pot of gratin juice. 2. Trim the green tops from the leeks. Coarsely chop 1 cup of the tops, wash them well, then drain. Cut the white part of the leeks in half lengthwise and thinly slice them. You should have about 2 cups. Wash well and drain. 3. Make the herbaceous cream: in a small, heavy-bottomed saucepan, combine the milk and cream with the leek tops, whole garlic, coriander, peppercorns, herb sprigs and leaves, and bay leaf. Bring to a simmer and cook over medium-low heat for 5 minutes. Set aside to steep for 30 minutes. Strain the cream. 4. Heat the butter and oil in a small skillet and add the leeks, 1/4 teaspoon salt, and a pinch of pepper. Cook over medium heat until soft, about 3 minutes; add the garlic and cook for 1 minute. Add the wine and cook until the pan is nearly dry, about 3 minutes. Transfer to a bowl and mix in the herbs. 5. Bring a medium-size pot of water to a boil and salt lightly. Peel and quarter the rutabaga and celery root. Use a vegetable slicer or sharp knife to thinly slice them, keeping them in separate piles. Drop the rutabaga into the pot and cook until just tender, 2 to 3 minutes. Using a strainer, scoop out the rutabaga, rinse under cold water, and drain. Repeat with the celery root. 6. Combine the cheeses and set aside. 7. Butter a 2-quart baking dish. Thinly slice the potatoes and lay one third of them in the bottom of the dish, overlapping the slices and rows as you go. Sprinkle with salt and pepper, half of the flour, and spread half of the leeks on top. Layer on the rutabaga and sprinkle with one third of the cheese. Follow with half of the remaining potatoes, sprinkle with salt and pepper, and the rest of the flour. Spread the remaining leeks over, layer on the celery root, and follow with one third of the cheese. Layer on the last of the potatoes, sprinkle with salt and pepper, and pour the cream over. 8. Cover the dish and bake for 45 minutes. Uncover, press the potatoes down with a spoon, and continue to bake, uncovered, until completely tender, 15 to 20 minutes more. Test for doneness with a paring knife or skewer. Sprinkle the rest of the cheese on top and return to the oven until golden on top, about 5 minutes more. Let the gratin sit for a few minutes before serving. It will soak up any excess cream as it begins to cool. gratin juice...that has a lovely ring to it (in addition to a stellar smell and taste, i'm sure). great dish, amy! Just found your blog, I like it! I also like you photo blog and your gratin. Looks great and I'll keep checking back.